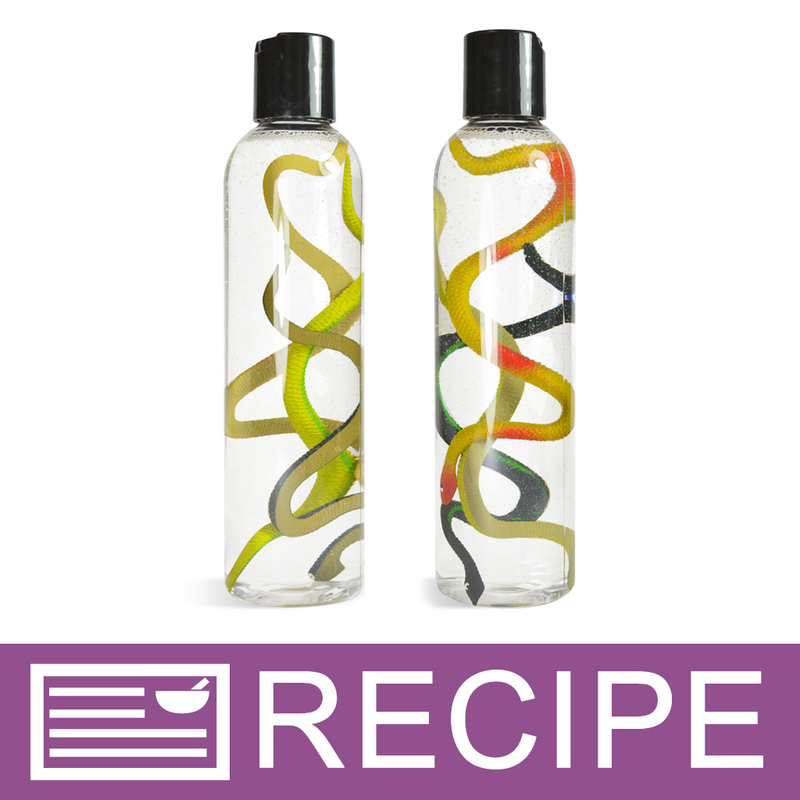 These vinyl snakes look great in a clear bottle of body wash, shower gel or liquid soap! These snake toys can also be embedded into melt & pour soap bars. Always a hit with kids! Dimensions: Approximately 7.5" - 9" in length. Vinyl Toys can enhance your handmade soaps, bath fizzies, clear shampoos and more! They are an adorable way to make kid-friendly soaps. To embed toy into soap, place in soap cavity and pour melted soap base over toy completely. Can also be placed in bottle of liquid soap, shampoo, etc. COMMENTS: I used these snakes in a liquid shower gel I made for kids. Followed the recipe for "slithering snake shower gel body wash". So cute and easy! COMMENTS: I did love these. I used them in a melt and pour soap. It turned out well. Ok well sort of. I didn't realize they were different sizes so the longer ones would pop out of mold when soap was poured in. The ones i could use look really cool. "Squiggly Wiggly Bubble Bath "
COMMENTS: I made a special bubblebath for my grandson's 3rd birthday and included these delightful snakes in the bottle. He was enthralled with his Squiggly Wiggly Bubble Bath that is made with Fresh Dirt Fragrance Oil. I also gave a bottle to my hairdresser for her grandson who has Smith Magenis Syndrome. He loved it and now I will be donating this Squiggly Wiggly Bubble Bath with it's adorable snakes for our next fundraiser in the Fall. COMMENTS: Just make sure they match, each snake is a different length, there are 4 in each set. 2 match each other. COMMENTS: Everyone has a comment for this one. They think there's actually snakes in the bottle. Big hit with the young boys. COMMENTS: I originally got these to work with my Melt and Pour soaps, However my nephews found them before that happened. They are a fun little addition to any clear soap or any little Nephews pocket ;) I definitely recommend these for the kids of all ages just makes it fun. COMMENTS: These are great inside liquid soaps for kids!!!! COMMENTS: part of kit- kids loved the slithering snake shower gel. COMMENTS: We got these as part of the slithering snake shower gel kit. My daughter was so excited to get these. She thought of a ton of other ways to use these cute little snakes. I can't wait for Halloween! COMMENTS: This little snakes gave me a startle when I opened the box they arrived in! I had forgotten they were in that order. I used them in clear shower gel to sell as a novelty item at a recent craft fair. They were so realistic that I had several young people ask me if they were real! LOL! Even the girl scouts in the booth next to mine were mesmerized by them. They sold well, so I will be buying more. COMMENTS: Grandsons and children at craft shows loved my "Snakes Alive" bottles. Even a lot of the girls loved them, of course the "girlie girls" squealed. • Held the color in the shower gel. • Add some neon colors too?? "One for the little boys!" COMMENTS: I add these critters to my body wash for the little guys- they love them in the bottles! COMMENTS: Nice detail on these little critters. Look great in bottles of bubble bath. I wish they were a little smaller so I could embed them into MP. "Looks Great In Bubble Bath"
COMMENTS: I use these in the WSP bubble bath and everybody loves them. Looks awesome sitting on the tub too. "Are these pliable? I want to use these in a melt and pour, not a jar. I don't want the snake to hurt someone. " Staff Answer Yes, these are soft vinyl snakes and they are very pliable.